The civil decks need to be smaller when you play with fewer than 4 players. For a 2- or 3-player game, remove certain cards from the Age I and Age II civil decks. For a 3-player game, remove the 3 cards marked 4 from each deck. For a 2-player game, remove the 6 cards marked 3+ and the 3 cards marked 4 each deck. So now you should have the six decks you will need for the game. Shuffle each deck separately. During setup, you need only the Age A decks. Keep the Age I and Age II decks nearby. They will be used later in the game. The card row displays civil cards that players may choose from. It is the central element of the game. Players' civilizations will be defined by the cards they take from the card row. Place it so that everyone can reach it and read the cards easily. Deal 13 cards from the Age A civil deck face up to the spaces of the card row. Science represents a civilization's knowledge and its ability to discover and adopt new ideas and inventions. A civilization's science rating is how many science points it produces each turn. The rating changes whenever the player builds or destroys something that produces science. All players' science rating markers (the round ones) start on space 1 of the science rating indicator. Check your player board. You begin with one Age A lab , as represented by the worker on the Philosophy technology. The 1 symbol at the bottom of the card means that each lab on the card produces 1 science. This is why your science rating is 1. 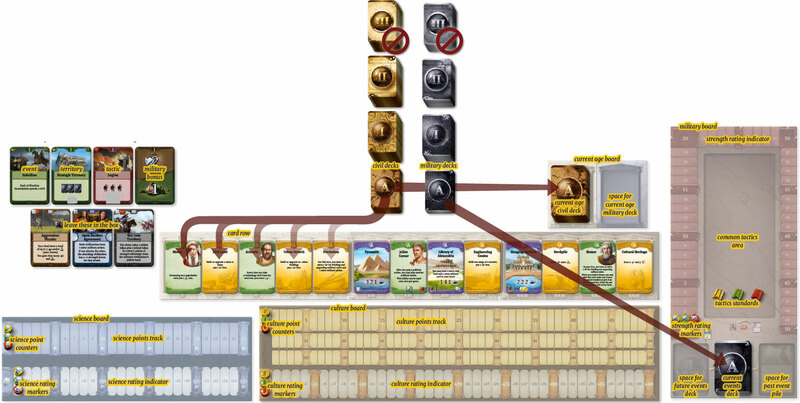 Civilizations score science points ( ) during the game, usually based on their science rating. They spend science points to develop technologies. All players' science point counters (the octagonal ones) start on space 0 of the science point track. You start the game with no science points. Because your science rating is 1, you will get your first point of science at the end of your first turn. Culture represents the impact and influence a civilization has on the entire world. Whether through art, religion, wonders, or even aggressions and wars, a civilization needs to spread its culture. At the end of the game, the civilization with the most culture points wins! A civilization's culture rating is how many culture points it produces each turn. The rating changes whenever the player builds or destroys something that produces culture. All players' culture rating markers (the round ones) start on space 0 of the culture rating indicator. On your player board, you see that Religion is the only card that could allow you to produce culture. Because you have no workers on the card, you have no temples , and so your civilization produces no culture. A civilization scores culture points ( ) during the game, usually based on its culture rating, but also for other deeds. Sometimes, a civilization may also lose culture points. All player's culture point counters (the octagonal ones) start on space 0 of the culture points track. This small board holds the civil and military decks for the current age. The current age civil deck holds the cards that are dealt to the card row. 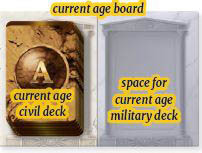 After dealing cards to the card row, put the rest of the Age A civil deck on the current age board. The current age military deck holds cards that can be drawn at the end of a turn. In Age A, however, this space remains empty. Players will never draw Age A military cards. Strength represents the might of a civilization's military units, its knowledge of warfare, and other military advantages. In your first game, it will be less crucial than in the full game because there will be no direct conflicts. However, strength is still relevant because stronger civilizations often benefit from events that happen during the game, while weaker civilizations may suffer. All players' strength rating markers start on space 1 of the strength rating indicator. On your player board, you have 1 worker on your Warriors card. This represents a warrior unit, which has strength 1. Because this is the only contribution to your strength, you have a strength rating of 1. The common tactics area is a space in the middle of the military board. Military tactics cards will be placed here during the game to represent that they have become known to all civilizations. Put the tactics standards of all civilizations in the common tactics area. These standards mark the current tactic of each player. At the start of the game, they are on no card - each player begins with no current tactic. 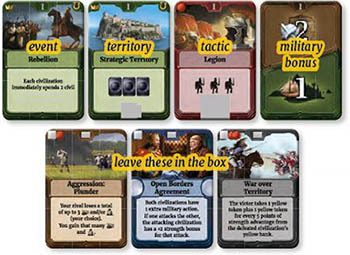 Two spaces on the military board are for events decks, which hold events that will happen during the game. The first few events are randomly chosen from the Age A military deck and placed on the current events space to make the current events deck. They are mostly positive. During the game, players will choose events from their hands and place them on the future events space. Each time a future event is prepared, a current event will be revealed. When all the Age A events are gone, the future events will become the new current events deck. Depending on the number of players, take the top 4, 5, or 6 cards from the Age A military deck and set them face down on the board as the current events deck. The number of cards is the number of players plus two. Return the rest of the Age A military deck to the box without looking at the cards. The space for the future events deck is empty at the start of the game. Events that are evaluated during the game are discarded to the past events pile face up. These events will not enter the game again.